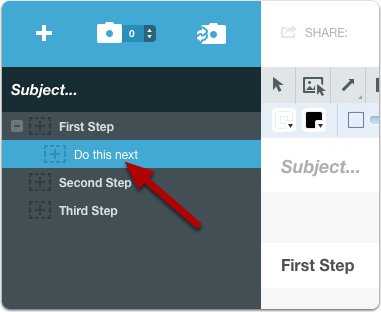 Clarify has the ability to create substeps. A substep is indented under the parent step and can be one level deep. A substep title will appear differently when you export the document. The step is now a substep. 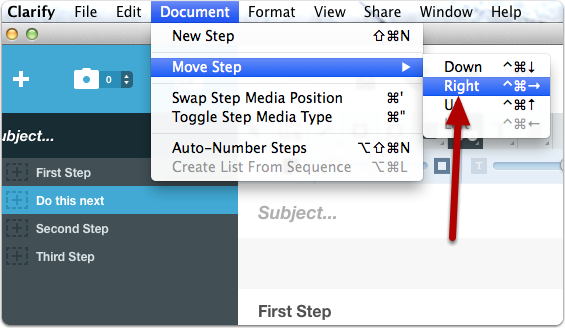 If you want to make the substep a step again just select the Document > Move Step > Left menu option. The addition of nesting is VERY much appreciated. Any plans to provide additional nesting levels in future releases? @Rhett - it is something we are considering. I would also like to see at least one more level of nesting. Two more levels would be handy in some cases as well. I too would like multiple levels of nesting. I would very much support the request for additional levels of nesting. Three levels are an absolute minimum for the work I do. It is helpful if you provide as much information about what you are trying to accomplish as possible. The outline/nesting functionality is great, and an essential feature. What would really be powerful is to include the outline as PDF Bookmarks on export, set to open automatically in any PDF viewer! PDF bookmark outlines make navigating PDFs so much easier, and would be one more awesome feature helping people structure, visualize, and Clarify information! @William Good news - Clarify already does this. Each step appears as an entry in the PDF table of contents and substeps are indented. Clarify adds an instruction to the PDF stating that the T of C should be shown when open. Not all PDF viewers respect the setting, however. As far as supporting outline structures, the other really key feature would be OPML import-- this would allow creating Clarify step sequences on an iOS device using one of the many outliner or MindMap apps that export OPML files (OmniOutliner, Carbonfin Outliner, iThoughts, MindNode, etc). 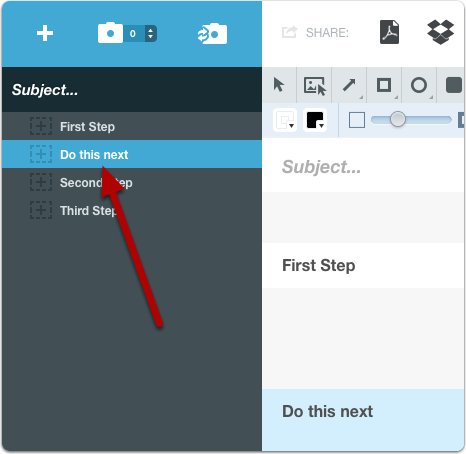 These steps could then be quickly opened in Clarify to add the images or screenshots and produce a visual document. This workflow would especially be great for the many uses for Clarify beyond simple instruction documents-- things like sequencing and explaining a series of travel photos, or research images, or website examples, etc,-- tasks where thinking through the steps/outline can often be better done on a mobile device or in a mindmap, then let Clarify smoothly capture, arrange, and annotate the images, and publish the file. Clarify is really a "visual outliner" and sequencer, so it needs to support the industry standard format for outline lists, which is OPML. I would like to ask you. There is one thing which I do not understand. One Clarify document = one question step-by-step described? I yes, I have to create eg. 100 Clarify documents for 100 questions - is it right? How do I one portal with all documents and search (eg. help.clarify-it.com)? If you wanted to create a portal using Clarify you would need to upload the documents to a platform such as WordPress. I too very much like the substeps! I would appreciate it even more if the 'move step' behavior were in accordance with the usual behavior of outliners. This is a confusing mix of outline behavior (B is treated as a whole - that is as an item in an outline) and list behavior (A is treated as a list of separate entries). This is list behavior, because all entries are treated as separate units. Delete however deletes al the subentries and, hence, treats the substeps as part as of the steps (which is outline behavior). @Arno - Excellent points. We will revisit this in the future and make things more consistent.